The conference is purposefully organized to be inclusive of all disciplines. 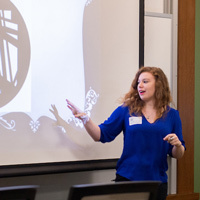 Webster University’s fourth Research Across Disciplines (RAD) Conference this month drew 64 undergraduate and graduate student research participants from across Webster and local universities, including Webster students presenting via videoconference from campuses in Europe and Webster's online learning programs. The conference, sponsored by Academic Affairs, buttresses on-going efforts to afford students access to the high-impact educational practice of collaborative research. Students and faculty alike benefit from collaborative research, and at Webster the impact of these practices continues to grow. “Opportunities like the RAD conference go a long way in strengthening our institution’s commitment to student-driven research,” said Eric Goedereis, associate professor, psychology, who served as faculty lead and mentor for the conference. The first bi-annual RAD conference was held in April 2015. 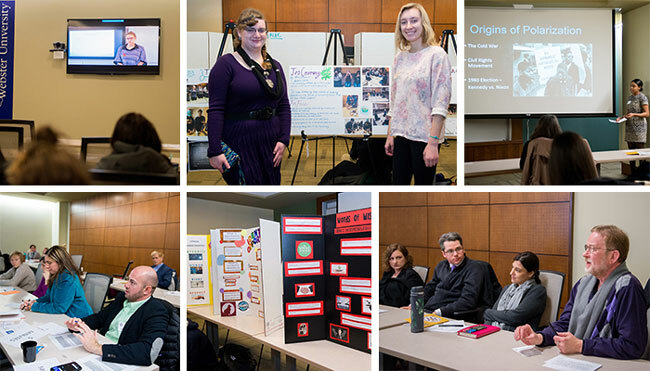 The conference's 27 oral presentations, seven poster presentations and one creative display included multiple students presenting via videoconference from Webster campuses in Europe. “By organizing the conference and purposefully making it inclusive of all disciplines, Webster is putting into place a concrete initiative aimed at promoting a culture of student-driven research at our university,” Goedereis said. New to the conference this year was the opportunity for Webster students across the global network to participate via pre-recorded presentations or live video conference presentations. That effort drew Webster student presenters from from Geneva, Vienna and Zurich, as well as students from Webster's online learning environment. Students from Maryville University and Saint Louis University also presented. The conference also included the First Year Inquiry Showcase, which displayed the results of inquiry projects conducted by students enrolled in First Year Seminars during the Fall 2016 semester under Webster's Global Citizenship Program. For anyone passionate about collaborative research, this is an exciting time to be at Webster. Liberal arts universities across the world are currently grasping for more ways to provide opportunities for students to engage in these sorts of experiences. Webster's commitment to the new Interdisciplinary Sciences Building and recent initiatives such as the Student/Faculty Collaborative Research Grant, external grant-seeking efforts, and of course, the RAD Conference are demonstrating Webster's commitment to meet this challenge. The conference is a tangible example of Webster’s commitment to this important aspect of student scholarship. It aligns with the University’s strategic plan goals to provide a global, student-centered experience by supporting programs that increase student engagement, access and success. Bookmark webster.edu/rad for updates on the next conference once plans are finalized.